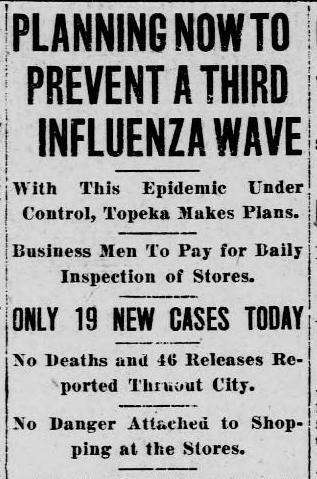 Topeka, KS health authorities are planning for a third wave of the influenza. The plan to surveil all diseases was presented to the chamber of commerce, and was enthusiastically endorsed. There will be no restrictions on stores or shopping. Nineteen new cases are reported, but 46 households were released from their quarantine. Source: “Planning Now to Prevent Third Influenza Wave,” The Topeka State Journal, December 16, 1918. Page 1, Column 3.